Choose the stats and rankings that soothe the beat beat beat of your fluttering heart my sweet. For the mind and it's sobering logic carries with it the cruelest of realities. C) Nobody knows how much Jake will ask the Dolphins for if we approach him about resigning, therefore nobody can say for certain if it will be worth our while to resign him. Given the fact that Jake Long's injury is in his lower body, I think there's some credence to the idea that his lateral movement is being hindered because of said injury. PFF's rankings after four games aren't going to sway me much, one way or another. If there's one thing I do trust Ireland about, it's getting rid of players who are no longer necessary. He sometimes does it a bit early for our tastes, but he doesn't tend to hold onto players that are no longer good fits for the team or pas their prime. I totally agree that even in a new system Jake Long is still still a great offensive tackle. The problem is that this level of play is not worth a Joe Thomas like contract so we might lose him for nothing come the offseason to a crazy team that thinks he is worth it. As for Dansby, I'm surprised he isn't the best linebacker. The guy has been everywhere stopping the run game. For the first time in a while, I can say he is actually making his money's worth. Cool so I don't expect any of you to be referring to their analysis anytime soon. Safe to say ? ......... eh no .... if they fed you the results that say Jake Long is the new Orlando Pace you would have no problem with their findings. Are you also gonna ignore the fact that Jake Long has admitted his quality of play has lessened ? Or do you know better than him too. ...alright, what exactly is different about a Tackle's pass blocking in a MBS vs ZBS? The reason I ask this is because we all know that Jake Long struggles with speed rushers. Freeney gave him fits. Abraham gave him fits. Whenever Jake Long has gone up against an elite pass rushing DE or OLB with speed, he's typically allowed some pressure and at least 1 sack on the QB. We've always known and dealt with the fact that Jake Long's pass-blocking isn't perfect. However, even though that was true, he was still one of the best Tackles in the NFL. He wasn't perfect but he was as good as anyone else was. I can believe that part of that was his run-blocking skill and that the run-blocking in a ZBS might be slightly different and not as ideal for him. But how is Jake Long's job any different in this new ZBS when he's pass protecting and attempting to shield Tannehill from a speedy edge rusher? This is a practical question I'm sure you'd agree. If he was good enough before in pass protection, why would he not be good enough now? How is kick-sliding outside and defending the pocket from an edge rusher any different between the two schemes? Man blocking is a power scheme in which person A blocks person B and physically abuses him for the entire 60 minutes. Zone blocking is LT open up area that you are assigned, and uses more double teams. It is commonly known for lighter linemen that can cover more ground. You don't need to be as physical as double teams kind of make that pointless and you need to make 2nd level blocks. Pass protection in ZBS requires the lineman to step into a gap and block the defender that attacks that gap. If there's no defender attacking that particular gap he combo blocks with the lineman next to him. In Man Blocking the lineman blocks the defender across from him or the nearest 2nd level defender, leaving the blitzer to a RB or FB. The problem with MBS in pass pro is Zone Blitzing by the defense. You will often see a linemen with the appearance of no one to block because the man lined up in front of him dropped off into coverage while a blitzer blew right by him. Hey ... again ... I'm a question asker. I'm no expert. I found this stuff out when Cam got the Ax and talk of Parcells types started. And even then I still wasn't clear on it. But I think I get it now. When did I say I knew better than anybody? All I said was that he wasn't worth 11.5M like Joe Thomas but he is still worth a good amount of cap(8-9M) and that Dansby was having a heck of a year. Do you seriously disagree with me on any of that? Where is this attack coming from? As for the MBS vs ZBS, both schemes only affect the running game. There are zone blocking schemes designed for pass protection called slides but they are just another type of protection. When you categorize a line by ZBS or MBS, you are talking about the running game. MBS: Lets assume that there is a regular 4 man rush. 4 of our offensive lineman will be focusing on those 4. The 5th and Fasano will be double blocking. The line in this case blocks laterally and each lineman will push the defensive player towards a direction away from the designed running lane. This leaves Bush to theoretically deal only with the linebackers. ZBS: Lets assume that there is a regular 4 man rush. We decide to run to the right side. Long, instead of focusing on the RE, will join Incognito and focus on the RDT. Pouncey and Jerry will focus on the LDT. Martin and Fasano will focus on the LE. After the guy in front of them is stabilized. One of Long/Incognito, Pouncey/Jerry, and Martin/Fasano will reach the second level, the linebackers, and leave the other behind to continue blocking their guy. This means that our line will be blocking vertically, rather than horizontally, at this point. Theoretically, this leaves Bush to deal only with the safeties. Both of these are best case scenarios and defenses do have ways to counter the ZBS. A blitz pretty much causes the ZBS to turn into the MBS for example since the whole idea of the ZBS is to block vertically rather than horizontally by limiting the amount of rushers and freeing up linemen which is impossible in a blitz situation. Another way is by shifting defensive lineman and linebackers to confuse the offensive line. The ZBS does require faster and smaller guys to be able to get to the second level and the MBS typically requires talented running backs that can deal with linebackers while the ZBS doesn't since the running back has more protection in that level. This is why the ZBS can make running backs look so good. My example was a regular outside zone play with basic 4 man rush. There are also inside zone and stretch plays. 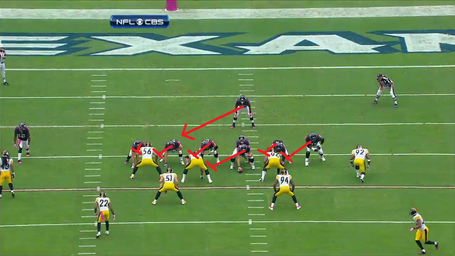 Defensive formations and lineups can vary the impact of a running play. I'm beginning to think you are a Dan Marino groupie who learned a little about football just to keep up over the years. You should never tell anyone about coherency. The way I see it - pass-protection is more of an art, less of a science. Aside from Jake possibly being put on an island more than in the past, im just not seeing this new 'scheme' that he's being asked to operate in. But dont let my casual knowledge interfere w/ your football brilliance. Please explain to us all what exactly Jake is being asked to do this year in pass-protection that is in contrast to years past that is leading to his drop-off. Thanks. The scheme is clearly different. He was used to man blocking, where he would be responsible for an individual. Now, he is responsible for a given area, and cut blocks are far more prominent to block the backside. So he used to be able to attack a specific individual, but now he has to wait to see who comes to his area, and protect his area. This requires more agility and lateral movement, and less power. Now, while I see that Long does not look like a Pro Bowler after five games, the OL has worked well as a unit and gotten better with time, despite a few errors on his part. I'd wait before I say he can't fit into the system but he probably isn't worth top dollar in the ZBS. There is always an element of zone blocking to a pass-protection scheme. How many times have you seen Jake pull across the line after a snap to block his 'man' who was rushing from the opposite side or have to pick-up a stunt or twist? All schemes allow for the ability to pick up protections when your 'man' isn't your man. They only way I could get on the trade Jake Long bandwagon is if we find out he isn't planning on resigning with us. From what you've explained, Jake Long isn't the ideal fit in the blocking scheme we currently run - that's fine. Jake provides so much more to this team than just his on-field play. He's well respected and can get on guys if they're dogging it, he provides consistency with both his play and the fact that he's one of the few guys that have been here multiple years, and he's a leader in the locker room. We're a young team that is showing growth for the first time in a decade. I don't think losing one of our best players on and off the field is the best move in the long-term interest of the franchise.